Our Work Tables (WT) can be used as island or wall units, and some can accommodate sinks, cooktops or eating counters as well. Having super functional tables can lighten the look of a furnished kitchen due to the openness under the countertop and the look that scuptured legs bring into the design. 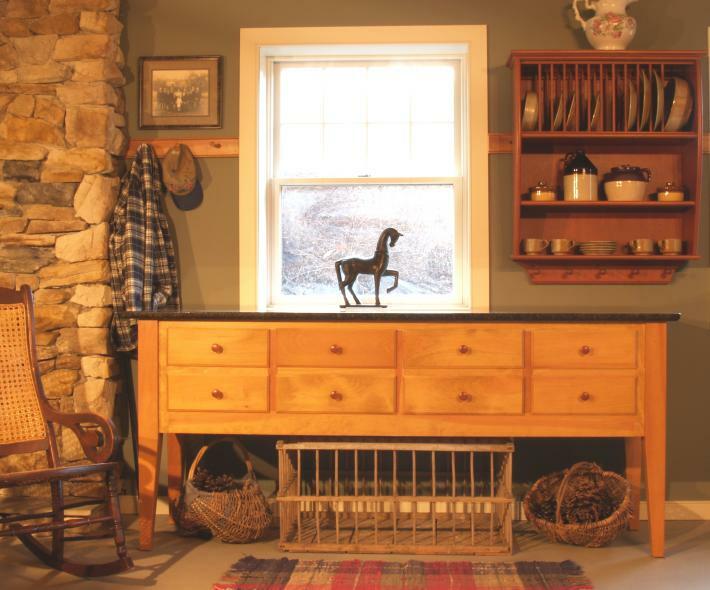 The image above is WTC-22×82, a table featured in Old English Pine with a Gold Rush Green granite top and our Shaker styling with its tapered legs. We also make unfitted English style tables with intricately turned legs and beaded inset drawers. Both styles come in 18 different sizes and three different drawer combinations, for a total of 108 different table combinations. The ‘C’ style table (two banks of drawers together) above is 22″ deep but 82″ long (our narrowest and longest size), so it is a great one to use between two full height wall units or as an island in a tight kitchen. The back of our work tables are always finished so they can be moved to different places if the need occurs. 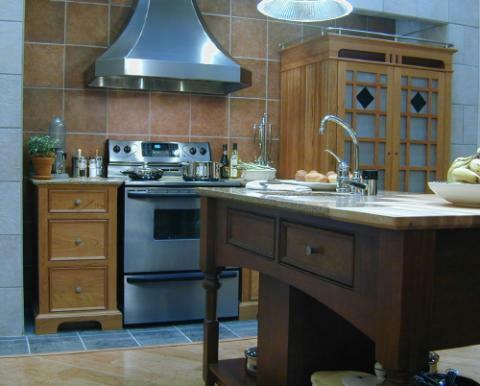 Sinks and Downdraft Cook tops can be installed in most of the models. 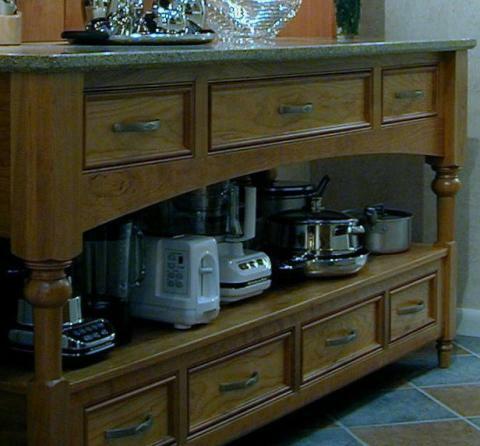 The 33″ deep models can also be used as breakfast bars that will accommodate medium height bar stools. 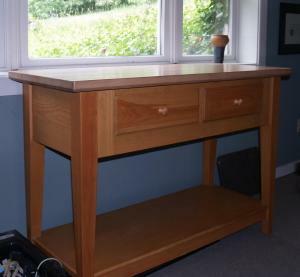 WTA-22 x 52 (Our smallest freestanding table) The ‘A’ Style has one exposed shelf below on bank of drawers. Styling is Shaker style. Sinks and Downdraft Cook tops can be installed in most of our work tables. 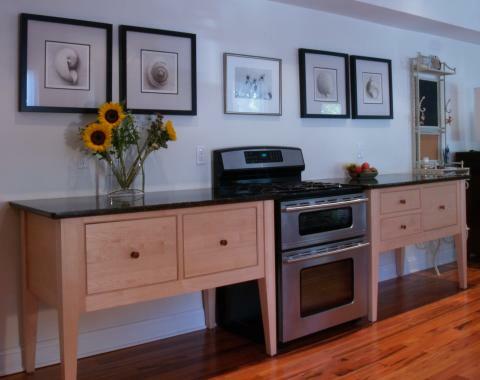 This island table features a prep sink with a disposer and a custom butcher block top integrated with a granite top. This Natural Cherry WTB-76 x 28 features the ‘B’ style that has two banks of drawers and a display/storage shelf. Styling is English Style. Here, two Natural Maple WTC-52×22 Work tables flank an exposed stainless steel range. The drawer sizes have been customized to fit the user’s needs. Styling is the Shaker style.